Do you want to save an extra money? If yes, U.S. OshKosh B'gosh gives you the chance! 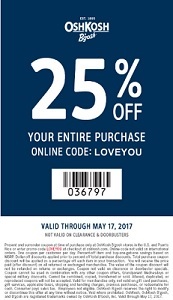 Take an extra 25% off your in-store and online purchase! To get your discount online, enter the promo code LOVEYOU at checkout. To get your discount in-store, use OshKosh B'gosh printable coupon. Offer is valid until May 17, 2017. Source of the information is OshKosh B'gosh. More details available at any U.S. OshKosh B'gosh store or OshKosh B'gosh online.